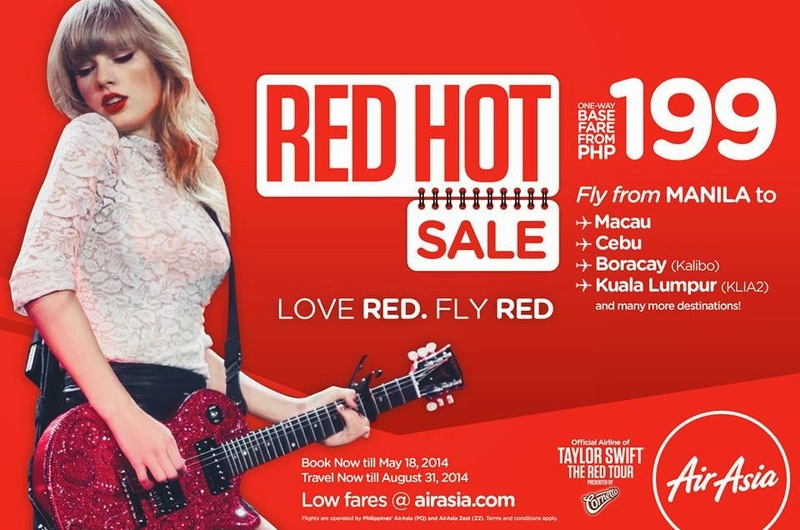 Air Asia Promo Fare 2014 to 2015: Few weeks to go before Taylor Swift’s RED Tour! We’re excited to fly her soon, so excited we’re going to throw lots of RED and Hot treats for you! To start-off, here’s our RED Hot P199 base fare sale! Book now at http://airasia.com/! Love RED, Fly RED with AirAsia, the official airline partner of the RED tour, presented by Cornetto! Fly to/from Manila, Cebu, Bohol, Boracay, Puerto Princesa and Tagbilaran from as low as P871 ALL-IN fare or go international to Seoul, Macau, Shanghai, Kota Kinabalu and Kuala Lumpur from as low as P1,539 ALL-IN fare! So what are you waiting for? Book for your immediate travels NOW! Also, stay tuned for more exciting announcements regarding the RED Tour!